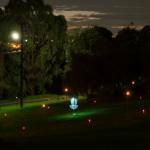 A little under three weeks ago at our regular Melbourne Disc Golf Club committee meeting we hatched a plan, to put on the very first PDGA/ADG sanctioned night golf event in Australia. Hunting for dates someone mused, ‘when is the next Friday 13th’. Finding there was one in June we had our first candidate date. 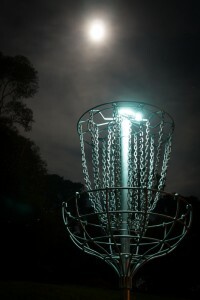 The conversation then turned to moons phases, and the preference for a New Moon for night golf. After checking out the phases we quickly found that our chosen day was going to actually be a Full Moon, despite the fact it wouldn’t be as dark, how could we possibly pass on that. This rare confluence of circumstances last occurred in October 2000 and won’t occur again until August 2049. The evening kicked off with a little brisk setup work just before dusk and then a great BBQ dinner while players registered and got their new LEDs taped to their discs. Players were provided with safety glasses and towels to keep the branches our of their eyes and their discs dry. With a brand new course layout specially created for the event a quick run through of all of the new holes was provided at the players meeting before getting underway and sending the 14 players in their 4 groups out to the appointed holes. You really can’t convey what its like to play Disc Golf at night, you just have to experience it, no amount of writing or photos can do it justice. 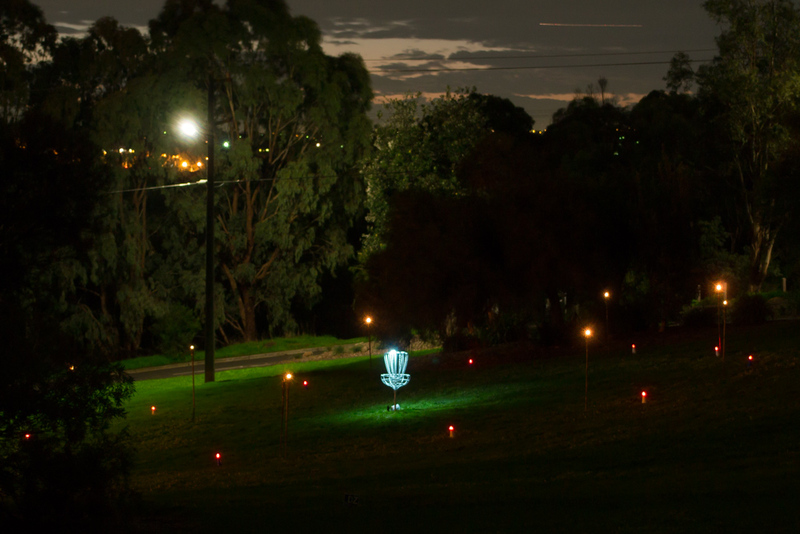 Walking around the course, hunting down the flashing lights on the tees and seeing each basket brightly lit around the park is just amazing. The baskets are even more visible than during the day and there are many places on the course you can see 5-6 baskets at once. 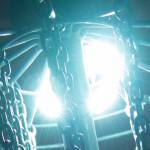 You might worry about losing discs but at night even a disc deep in the woods is fantastically easy to find. Players coming back off the course all had some interesting stories to tell and everyone had a blast. Oli, dressed in a skeleton Onesie managed to lose almost everything he had at several points during his round including the torch that each group was provided with (it was later found), his phone (later found) and also managed to dislodge the lights from all of his discs (apparently resulting in a streak of birdies) but in the end still shot a very respectable 55. It was also great to see a Junior player, Ethan Moore getting in on the action and having a great time and thanks to Andy, for letting him stay up late. Jeff and Allen Brunsting had quite a battle going between them as usual, changing places many times during their round. Allen managed to edge out Jeff by a single stroke at the end of the round with a 59. 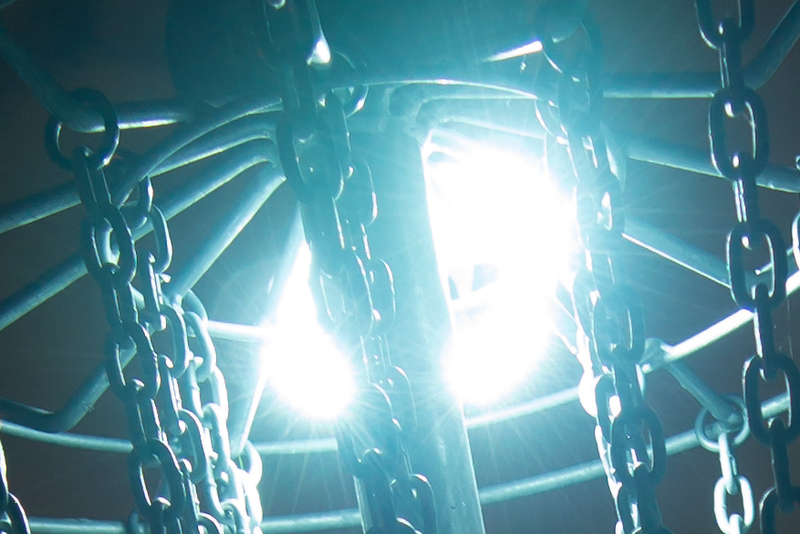 There were a few other stories of lights coming off discs but for most people they seemed to stick pretty solid. Two players who were battling it out on separate cards definitely had no technical problems, Greg and Paul were both (unbeknownst to each other) having great rounds, possibly something to do with having played the entire course through the day before. Coming into their last holes they were both tied on -4, Greg taking a bogie on his final hole handed victory to Paul who shot his first bogie free round in a sanctioned event. It was an amazing evening, we learnt quite a few lessons for our next Night Golf event (stay tuned for dates) and it was great to see many players sticking around to help break down the course and collect all of the equipment. Thanks go out to all of the players, the Melbourne Disc Golf club for supporting the event and everyone who helped organise the logistics for the event in under three weeks. For winners of the other divisions we will get some prizes out to you at the league day if you are attending. We’ll see you at the next Night Golf event!